Exploring Costa Rica is rather easy to do. With well-maintained National Parks, hundreds of up-kept beaches, and modernly developed city streets, the country is just begging to be explored. You’ll find tourist maps at your hotel and hundreds of online suggestions of places to go and sites to see. Doubtlessly, you’ll have a few prioritized items to check off your itinerary. You’ll want to hit up a couple of white-sand beaches, scale a volcano or two, and even visit one of the country’s many interesting museums. If you do find yourself with a spot in your itinerary for a day-trip, however, it might be fun to jump off the beaten path. Costa Rica is a small country with an almost unlimited supply of adventure opportunities, but it still has a few well-kept secrets. Small, rural towns with unique attractions still loiter the countryside, and many of these towns have proven to be perfect day trip destinations. Take a day off from the wind and surf and try visiting the small town of Sarchi, you won’t be disappointed. Sarchi is a quaint, rural town located just Northwest of Alajuela City. If you find yourself visiting the popular city of Grecia, you’re right on top of the rural Sarchi, but still, you may not have heard of this small village. Sarchi is most well-known for being the home of Costa Rica’s largest population of artists. A day trip to Sarchi is the perfect destination for the entire family. You’ll be able to see over 200 family owned art stores featuring everything from paintings to woodwork and leather making. You’ll also be within the perfect distance to add a visit to the Poas Volcano, a coffee plantation tour, and a walk around the Juan Castro Blanco National Park to your itinerary. 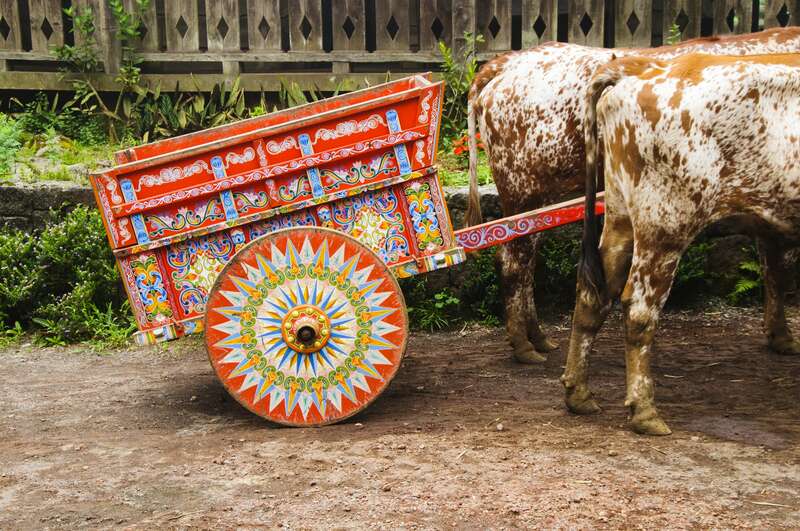 Sarchi is famous for creating the colorful and elaborately painted oxen carts used throughout the country, now more often as decorations than for agricultural use. The ox cart is a national symbol of the fertility of the northern highlands. 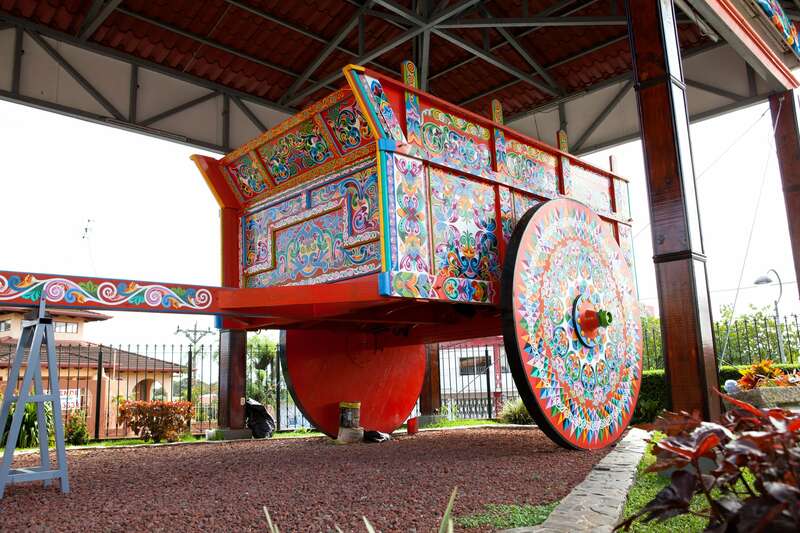 This ox cart was used to transport coffee beans throughout the country, and the simple transportation work led to one of the country’s biggest industries, coffee exportation. Originally, each farm had its own particular ox cart design, the cart depicting the coffee’s farm of origin and the wheels depicting the farmer’s city of origin. Today, these honorably decorated ox carts are used as decorations on farms, in local-food restaurants, and in public spaces. While you’re checking out all the unique, hand-painted designs, you’ll need to make a stop to see the Guinness Book of World Record’s Largest Ox Cart, displayed on a platform in the city’s central park. The city began its art industry with ox carts, but has continued to evolve with the needs of the nation. Currently, Costa Rican locals travel to Sarchi to buy high-quality, hand-made wooden furniture and house goods. They take advantage of the trip to find leather goods, hand-made paper, textiles, and decorative ceramics. You’ll have already spent time getting to know artists in their families’ shops, and you’ll have run into the huge painted ox cart in the center of the city, but there’s more to do in this town before you set out for a nearby volcano expedition. While you’re in town, walk through the artisan market and chat with the artists. This may be an incredible opportunity to find art to bring home with you or even shippable furniture, such as bookcases or bed headboards. You’ll also want to visit the Artisan Plaza, which sells smaller items, such as souvenirs for your at-home supporters. 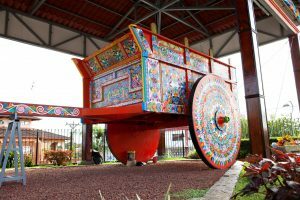 While you’re there, check out the Juaquin Chaverri Oxcart factory, which recently celebrated its 111th birthday. You’ll watch oxcarts being built and painted by the in-house artisans. Many of these ox carts will be put to use on nearby coffee plantations. You may not be in the position to make any large home buys, but the local artists will make the products of Sarchi very tempting. Luckily, there are still great souvenirs and home-goods you can buy inexpensively to take home with you. For any at-home supporters, a miniature, brightly colored ox cart will be the perfect souvenir. It will be festive, hand-made, and will support the local economy. You’ll also have canvas art and ceramic work to choose from. For those who don’t decorate their house with much art, try a small, leather-bound notebook. You’ll want something for yourself as well, and there are plenty of practical options. Try a hand-made wood and leather rocking chair for your home. Many stores will be willing to fedex your purchase back home, to be waiting for you when you arrive. Be sure to check out any accessories made especially for your chair, such as a cup holder or padded arm rests. Even better, try small home items that can be stowed in your suitcase, no extra charges. Sarchi woodworkers sell kitchen cutting boards, jewelry boxes, and wooden chests, all made out of local, tropical wood. You’ll also find home-made ceramics plates and pots decorated in the indigenous Chorotega tradition, from the Nicoya region. While you’re in Sarchi, grabbing lunch will be part of the cultural experience. You’re in the fertile highlands of Costa Rica, and you’ll be able to taste it in the freshness of your meal. For a big meal made from local ingredients, try Restaurante La Finca, or “the farm restaurant.” You’ll have an open-walled restaurant so you can enjoy the high-up views while you finish your meal. This meal will be traditional Costa Rican and Latin cooking, filled with veggies, sauces, and huge portions of proteins. Try the sea bass or the steak, you won’t be disappointed. Enjoying your fresh meal surrounded by local art and music will be the perfect way to relax after a long day of walking. Later in the day, you may need a coffee pick-me-up. Luckily, you’re in the exact right place. You can head back to the same restaurant, or try any of the other small coffee shops boasting local coffee and an incredible view. You’re also within driving distance of several coffee farms and tours, so if your travel group is up for making a whole afternoon of it, you can drive to your favorite coffee plantation and see how your morning brew is processed. You’ll have tastings, tours, and buying opportunities right from the source. Your entire day will be spent supporting local artists and farmers. 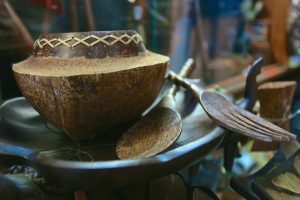 Not only will you find some incredibly beautiful and cultural art pieces for your home, you’ll see a genuine part of Costa Rican culture not enjoyed by most tourists to the region. Your purchases will be the perfect tropical splash of color in your home, and they’ll keep you dreaming of Costa Rica year-round.